Based on the science of efficiency, Shell V-Power is a premium 98 octane unleaded fuel designed to protect your car’s engine against gunk and corrosion. Deliver a more powerful performance. Shell V-Power is formulated to prevent the build-up of power-robbing inlet valve deposits and help remove any that have been left behind by other fuels. So the engine can breathe easily and burn fuel more completely. Shell V-Power contains Friction Modification Technology (FMT), which is designed to reduce friction in critical engine areas, allowing the engine to turn more freely and helping to unlock valuable energy to deliver more power to the wheels. 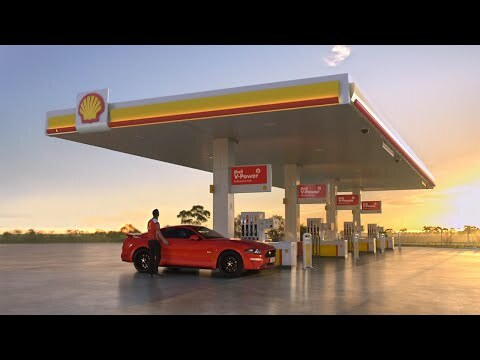 A 30-second TVC for Shell V-Power 98, featuring the Shell V-Power Racing Team car tracing a mathematical formula in a laboratory style environment, alluding to the science that the fuel has been derived from. Open with a slow zoom onto a beaker of golden liquid. A drop falls into the beaker. Cut to a close up as the drop lands in the liquid contained within. A light chime like sound effect as the drop lands in the beaker. The sound of the Shell V-Power Racing Team car engine comes to life, and is heard throughout under the visuals. A low angle shot of the Shell V-Power Racing Team car accelerating away from camera. 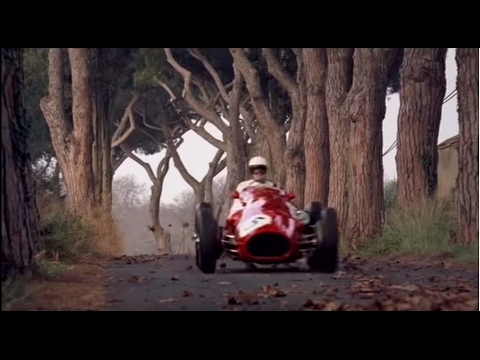 A top down reverse tracking shot then shows the car, the Shell pecten prominent on its hood, drive onto a thick red line. A medium shot shows the Shell V-Power Racing Team car is driving through a white hangar type environment, following the red line as it arcs along the hangar floor. As the car sounds continue, a low frequency atmospheric tone resonates. A rear angle shot then shows the Shell V-Power Racing Team car approaching a gap between two large tanks of the golden liquid seen earlier in the beaker. A tracking shot shows the Shell V-Power Racing Team car driving over a large red E as it enters between the two tanks of golden liquid. The shot continues as we see the Shell V-Power Racing team car in transparent profile as it behind the glass walls of the tank. A low angle shot as the Shell V-Power Racing Team car traces a curve arcing to the right across the white hangar floor. A high angled overhead shot reveals the Shell V-Power Racing Team car has been tracing the lines of a scientific formula, E = (1-R) + G – X, where the red lines are the algebraic notation and the tanks of golden liquid form the ‘approximately equal to’ symbol. The underlying score increases in volume and develops a noticeable rhythm. Can impact this simple equation. Low angle reverse shot revealing the Shell V-Power Racing Team car approaching the camera. 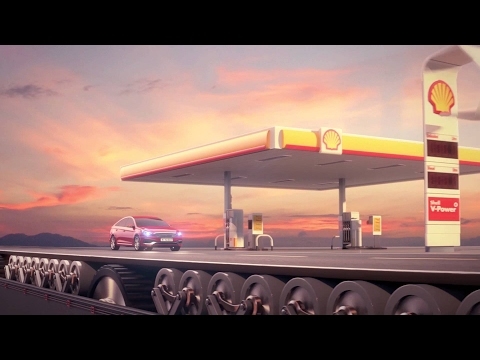 The shot changes to a profile view of the car passing, with a special effect transforming the Shell V-Power vehicle into a red consumer sedan. An otherworldly mechanical sound effect accompanies the visual transformation of the car. Mid-shot of the transformed car coming to a stop as the environment around it similarly transforms from the white hanger into a Shell service station forecourt. Shot of Scott McLaughlin of the Shell V-Power Racing Team opening the vehicle door. Mid-shot of Scott McLaughlin exiting the vehicle and stepping into the forecourt. You needn’t worry about the math. Long shot of Scott McLaughlin looks at the service station as it completes its transformation. Shell V-Power. Racing technology. Everyday efficiency. Shell Pecten against a white background, accompanied by Shell musical sting. An informative video demonstrates the features and benefits that using Shell V-Power Nitro+ has on your engine. The sound of an engine starting up is heard. Atmospheric and mellow music plays in the background. Your car’s engine starts its life free from gunk and corrosion. A headlight and front bumper of a red car is seen, partly shaded. The headlights turn on and the camera pans out, remaining at a low-angled level. The car is seen pulling out of a house garage, made of white bricks and red slate roofing. Similar looking houses are seen to the left and right as the car pulls out of it’s driveway to the right and out of the neighbourhood. A warm morning’s glow is cast over the car and scenery. The bottom of the screen reveals cogs and machinery lying beneath the road; the “road” is a conveyor belt. Cut to a high-angled shot as the car drives along the road on the right-hand side. The camera follows the car from behind, keeping a steady distance. Two-dimensional houses line the road on the right, with their shadows being cast on the wall behind them. The road and houses form part of a set that the car drives through. Over time however, it faces challenges that can affect its performance. Cut to a high-angled shot in line with the car from the right hand side. The houses that line the road begin to fold away on themselves. The cogs and machinery are seen clearly below the conveyor belt road. The road then rotates towards the screen on a horizontal axis, revealing a running petrol engine. The car remains fixed to the underside of the conveyor belt as a petrol engine is carried along the top of the road. Build-up of gunk on key components such as petrol engine intake valves and fuel injectors can impair combustion. Cut to a close-up shot as the engine enters the frame from the left. The components of the engine are spinning. The engine then deconstructs as the panels of the engine pull apart, rotate and fold away, revealing the camshaft, pistons, valves and fuel injectors. This can result in reduced performance and your engine not delivering to its best. The camera focuses in on the engine valves, spark plugs and fuel injectors via zoom blur transition. As the components move, the zoom is increased on the valves, where a build up of brown, gunky deposits have accumulated on their surfaces. Shell V-Power Nitro+ Unleaded is designed to protect your car’s performance. Uplifting, singular piano notes are added to the warm, visceral background strings. Cut to a low-angled, three-quarter shot of the red car from the front. Pieces of construction fold up and connect to create a Shell fuel station. The car pulls up along side it and comes to a halt. The fuel acts instantly in your engine and is formulated to work under the extreme conditions of the fuel injection system, breaking down and cleaning-away harmful gunky deposits. Cut to a close up shot of the cars rear quarter panel. Shell fuel pumps and branded headers can be seen in the background. The car’s fuel cap cover unhinges and flips open. Cut to close-up shot of the internal engine components. As the camera pans from left to right, we see a red beam of light come out of the fuel injector and swirl around one of the engine valves. The visible, brown deposits on all of the valves begin to fade away and show more of the shiny, metallic surfaces that were covered by gunk. The components of the engine continue to move in unison. Cut to zoom blur transition as the camera pulls out of the engine, showing all of the internal components working together. It also forms a protective film on metal surfaces, helping to protect precision fuel system components from corrosion. The external panels of the engine begin to reappear, rotate and assemble to construct the full engine again. At Shell we know that even if you’re trying to get to a meeting, the performance of your car matters. The conveyor belt rotates away from the camera on a horizontal axis to reveal the red car and hide the engine underneath the road. Cut to an aerial shot of the car driving along the road, as skyscrapers and city buildings unfold on the left side of the shot. So while you’re worrying about getting to work, we’re worrying about your engine. Cut to a low-angle three-quarter shot of the car from the front. The car drives past the camera from left to right as the camera raises up to reveal a vast cityscape shown in the background, built from the two-dimensional buildings that were unfolded. A large, white billboard featuring a red Shell V-Power Nitro+ logo enters the shot from the right as the cityscape becomes out of focus. The camera pauses on this frame. Cut to the Shell sign off as the screen is flooded white with the Shell red and yellow pecten featured centrally. Deep string notes are played in isolation, mimicking the singular piano notes heard earlier in the film. Watch behind the scenes footage from the Shell V-Power 98 TV commercial.